Director: Theo Angelopoulos. Cast: Nikos Poursadinis, Alexandra Aidini, Giorgos Armenis, Vassilis Kolovos, Thalia Argiriou, Eva Kotamanidou. Screenplay: Theo Angelopoulos, Petros Markaris, Giorgio Silvagni, and Tonino Guerra. Twitter Capsule: Stately drama in Angelopoulos' inimitable vein. Intimate myth that still views humans as rather tiny. VOR: ④ On one hand, there's no question that Angelopoulos isn't innovating new tricks. On the other, his durable style is so prodigious and so underrecognized in the US. See it! This review is for acquarello, as generous a friend as she is a critic. I live for the day when I finally see a Theo Angelopoulos movie in a cinema, big and broad, the way all moviesbut some more than othersare meant to be seen. But the American distribution market is unkind to fans of Angelopoulos, one of the greatest living directors whose name, in this country, means so close to nothing. You have to haunt true-blue art theaters, closer to MoMA than to Miramax, to have any hope of finding these films outside the festival circuit. I consider this a tremendous shame, because my first two exposures to Angelopoulos's work have shown it to be so soulful and enlightening. About a year ago, I saw his four-hour epic The Travelling Players on video and was immediately won over to his aesthetic of very long takes, tectonic montage, sober historical address, and tragic fatalism, an implacable, self-consciously mythic style by which this Greek filmmaker certainly comes naturally. Angelopoulos attained wider name recognition when Ulysses' Gaze won the Grand Jury Prize at Cannes in 1995, and again in 1998 when Eternity and a Day unanimously won the Palme d'or. Ulysses' Gaze is available on Region 1 DVD, joined in that format only this month by 1988's Landscape in the Mist, a favorite of the director's most ardent fans. If I believe what I read, those core supporters were generally cool to Angelopoulos's films of the 1990s. Reactions to his most recent movie, Trilogy: The Weeping Meadow, were comparatively warm, so I was determined to track down an imported DVD and find a place to watch it. Trilogy: The Weeping Meadow is not the fully arresting experience that The Travelling Players is, but it's a commanding piece of filmmaking all the same, a serious historical epic that boldly reorchestrates the usual protocols of that genre, and a fractured family saga that accumulates power as it continues. In the first, stately shot of the film, a clan of black-clad refugees marches forward from a bleary blue horizon of nothing, trekking toward the bare, eroded bank of a river as a narrator informs us that it is "around 1919." These people are newly arrived from the Greek communities of Odessa, pulverized by the Bolshevik uprisings and tsarist suppressions that anyone familiar with The Battleship Potemkin can mostly fill in for themselves. Angelopoulos has a propensity for symmetrical framings, and in this first impression, both the shot and the narrator call our attention to the small boy and girl trembling between their parents, reaching subtly for each other's hands. Crucially, the girl is not the biological daughter of this family, but an orphan they have absorbed into their group while on their way from Odessa. Cut forward a decade or so and this same girl, Eleni, is being carried home to this same village in a hush. Her adoptive father Spyros (Vassilis Kolovos) believes she has been recovering from illness in Thessaloniki, but Spyros' wife Danae (Thalia Argiriou) and sister Cassandra (Eva Kotamanidou, Elektra in The Travelling Players) know that this pale, feeble teenager has just given birth to twin boys and given them away for adoption to escape the certain wrath of Spyros. The father of these children is her adoptive brother, unnamed in the movie, and he visits Eleni's room under cover of darkness, pledging his love for her and reminding her of their conspiratorial childhood plan of fleeing together in the direction of the river, following it to its source, and settling down by themselves. With only The Travelling Players and inherited wisdom to guide my viewing, The Weeping Meadow already seemed to be locking the expected elements into place: not just Angelopoulous' typically monumentalizing frames and long-duration shots but the incestuous family dynamics, the abrupt transitions in time, the Attic atmosphere of foretold doom, and the unstoppable, inhuman forward motion of history. Clearly, we have missed complex and critical narrative information in the deceptively modest cut from the first scene to the second. Even more startlingly, the third scene finds Danae already dead and Spyros an elderly groom deserted at the altar by his bride, who is none other than Eleni herself (played as an adult by Alexandra Aidini). Spyros finds her sopping wedding veil, caught and slung on some stunted brush in the tideland, and he crumbles into the flat brown surf. Eleni, still in her white dress, meets her brother/lover (Nikos Poursadinis) well outside of town, shortly before they are identified by a passing truckload of men who recognize them instantly and intone, "Everyone is looking for you." But this stern-looking band of men help the lovers make their way to Thessaloniki, rather than returning them back home. In an Angelopoulos movie, in keeping with the grim colors and looming shades of national misfortune, we can only assume that the couple's flight will merely postpone or prolong their suffering rather than truly preclude it, but it does confer on The Weeping Meadow a tonal range that The Travelling Players didn't quite allow itself. Because of their constantly pressed circumstances, "ardor" is not quite the right word for the furtive and interrupted passion we witness between Eleni and her lover, a brilliant accordionist who has had the good luck to fall in with a troupe led by a kind violinist named Nikos (Giorgos Armenis). The film never sits easily, and nor do its characters. But Eleni and "The Kid" or "The Young Man," as he is recurrently hailed, make a decent go of things, reclaiming their twin sons Yorgos and Yannis and holding together as local politics, labor strikes, unemployment, brewing international war, and Spyros' tireless quest for his stolen bride continually worry and displace them. Through a few of these early passages, it cannot be denied that The Weeping Meadow, for all of its formal and stylistic continuities, lacks something of The Travelling Players' august authority as both story and spectacle. Angelopoulos' dramaturgical view of history, as an all but depersonalized force that prods and pushes its characters, takes more than a little getting used to. Some of the film's gestures just seem crude, as when we cut directly from an important scene of this wobbly family's reunion to a public loudspeaker blaring the rise of a leftist popular front. Clearly cast for their faces and figures rather than their emotional ranges, Angelopoulos' actors contribute revealing frowns and glances that nonetheless don't quite solidify into characters. At least he is consistent, flattening historical events in more or less the same way, refusing to cede his narrative to major events like World War II or the Greek Civil War, into which we arrive in medias res rather than watching them dawn, gather, and erupt as we do in the English Patients and Doctor Zhivagos that often guide our expectations for how "history" transpires in movies. Local crises like floods and feuds refuse to take a back seat to fascist takeovers or epochal migrations, which can baffle the viewer who expects to see a consensus historical record rise like a mountain chain from the flat plains of daily life. Angelopoulos seems to mind quite little if we know just what his scenes or his often-outsized symbols mean, so long as we partake of the feelings and reflections they incite. To that end, The Weeping Meadowthe Trilogy in its title implies two follow-up films that may or may not get madeoffers an array of imposing visual set-pieces, stretching from the thrilling to the nearly failed. In one sequence over which the filmmakers clearly labored, our temporarily happy protagonists wade through a forest of laundered white bedsheets, left out to dry, amongst which are concealed the town's musicians. Boldly affiliated with the labor movement, and therefore terrorized by armed patrols, these men make sweet music from amid this scenic, convenient refuge. Angelopoulos, usually so austered with his edits, allows a multitude of continuity cuts here as Eleni and her lover play a fleeting game of peekaboo with the players, who finally gather at the nearby seashore to bring their performance to a rousing endone that, like much in Angelopoulos, does not reach a peaceable finish. Angelopoulos' tone is so matter-of-fact that viewers' reactions even to his biggest dramatic climaxes might be a bit chilled; in that sense, despite its formal energy and harsh punctuation point, the sequence just doesn't work. The setting and trajectory feel equally artificial, and the unexpected arrival of a locomotive at a key, terrible moment doesn't make the scene any less mechanistic. Sluggishness, impersonality, rigid determinism, and an incongruous aplomb about artists and their resiliency are among the accusations that most plague Angelopoulos from his detractors. Thus, it's a little deflating to behold a scene that appears to emblematize those weaknesses despite what I perceived a visible attempt at an emotional wallop. But the heights of The Weeping Meadow, even when they describe pained or difficult moments, are invigorating in their narrative strength, which if anything is reinforced by their formal simplicity. Because so few filmmakers will shoot this way, and even fewer could do so without collapsing into tedium or listlessness, Angelopoulos generates effects and gets away with conceits that you wouldn't see attempted, much less would you admire, in other movies on similar themes. The greasy ochres and inky blacks that define the movie's palette bear a strong affective power in themselves, and they impart their own ironies. The former recurs as the color of the earth and its handmade buildings, no matter where the characters travel; eventually it is also the sallow shade of the characters themselves, as they are harried by awful decisions and harrowed by loss. As public and personal histories take their tolls, then, the people who withstand them start to look more and more like the soil on which they walk, and to which they all return. For the opposite reason, the film's stark, funereal blacks provide visual relief in many shots, allowing us to see our characters from great distances and to affirm that they still move and live against rough backgrounds, and amid strafing circumstances. The production design is spare but impressive throughout, with rural photography that looks like a Millet painting or an especially misty Thomas Hardy novel brought to weary life. At one point Eleni and The Young Man bide time amid their elopement inside a majestic theater that has been colonized as a refugee camp, its opera boxes and mezzanines hung with sheets and cheap scrims that speak beautifully to the fragility of privacy, both for refugees everywhere and for this hunted, perverse couple. 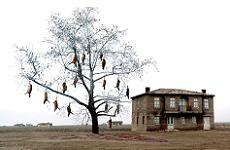 The truly Guignol sight of Spyros' flock of sheep, gutted and hung to die on the branches of an enormous tree, greet the couple when they return to the village they shocked and disgraced so deeply; a simple downward tilt of the camera reveals the clay around the tree, baptised in animal blood it can't fully swallow. Not long after this macabre encounter, the village is submerged by deceptively placid floodwaters that yield equally indelible images. The single greatest scene in the film, better than many other films ever achieve, transpires as The Young Man embarks on a great ship bound for America, hoping to make his musical career alongside a nationally famous mentor and thereby to send for his now-wife and their growing boys. Eleni regrets at portside that she hasn't had time to finish the scarf or sweater (I couldn't discern which) that she was knitting him as a farewell. Her husband grabs the end of yarn trailing off one needle, and as a small rowboat conveys him away from the dock and toward the waiting steamer, the yarn extends like Theseus' spool through the labyrinththe green ocean and the imagined destination are hardly less perilous, and finding his way back to Greece (which, at this point, is far from his intention) will prove an ordeal. The moment, begun with a long closeup on Eleni's hands clutching her knitting as it unwinds, is a richly suggestive tableau, and it lifts the movie into a plane of palpable emotion that I'd been hoping it might attain, alongside the other forms of meditation Angelopoulos inspires. In the final chapters, Eleni will be jailed for housing a traitor, and while she languishes in her cell, her sons find their way onto opposite sides of the Greek Civil Wars that were the terrible legacy of World War II. Further tragedy, and I use the term advisedly, befalls Eleni at a pace that even a pessimist wouldn't predict. As Angelopoulos heads into these most schematic passages of his narrative, though, his direction feels newly accommodating, patient with emotion and confident that the expression of personal feeling can reveal historical content instead of automatically distorting it, and without requiring heavy formalist intervention. The boundaries of her performance suddenly widened, Alexandra Aidini does shattering work with a despondent monologue in which she mostly repeats a few scrambled phrases: "The uniforms change," "I have no soap," "Where are you taking me?" It seems forever the fate of Greek tragedies that they end with women, desperate to console each other in wholly disconsolate climes. As Aidini pulls the audience into the long-concealed depths of Eleni's despair, and Angelopoulos climactically reveals the basis for his film's evocative title, The Weeping Meadow feels urgent and impressive, absorbent of the world's pain in a way that answers nothing but movingly testifies to an experience shared by so many people in and outside Greece. Furnishing us with a style, a structure, and an emblematic image expressing a global dismay that so often feels inexpressible, Angelopoulos courts a kind of wintry humanism that I was electrified to experience. It mattered little to me that the literal image on which the movie closes is infinitely more clichéd than the gorgeous one described in simultaneous narration. And as much as they intrigued me, the widening loopholes of formal and narrative play near the movie's enda living woman observes characters we know to be dead as they discuss her own death, as an apparently past eventwere not what sealed my esteem for the film. Trilogy: The Weeping Meadow is flawed and occasionally frustrating, but the heart and humanity that glimmer through the movie finally emerge in palpable relief, while still resisting any simple sentimentality.